Have you ever stopped and taken notice of the environment surrounding your everyday routine? While taking a mid-evening stroll this past week, I was in awe of the handiwork of God that enveloped me in nature. The leaves were hues of orange and red, ducks were quacking, and a gentle breeze pushed me to complete my 3 mile walk for the day. Simply overwhelmed by the beauty that God had created, I stopped and sat (picture below) and this came to my mind…. 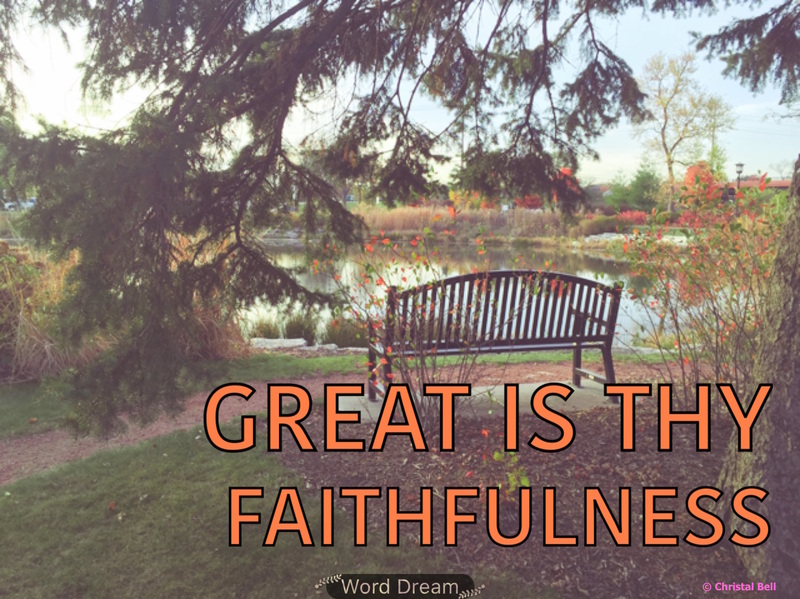 God’s faithfulness towards us is great! Mercies we see every morning, we just have to literally at times STOP & TAKE NOTICE! So as you begin the month of November: stop and feel the breeze, sit and listen for God’s voice, and sing praises to God, for His faithfulness.